As you can see from the caption with the metadata information, I used a full frame camera with an 85mm lens at an aperture of f/1.4. This is my go-to camera/lens combination for portraits like this. Whenever possible I shoot at f/1.4, which gives the background a beautiful, dreamy look like you see here. A few people guessed that I spot metered for the face, which is indeed what I did. This image was taken in Fort Collins, CO near the Poudre River. 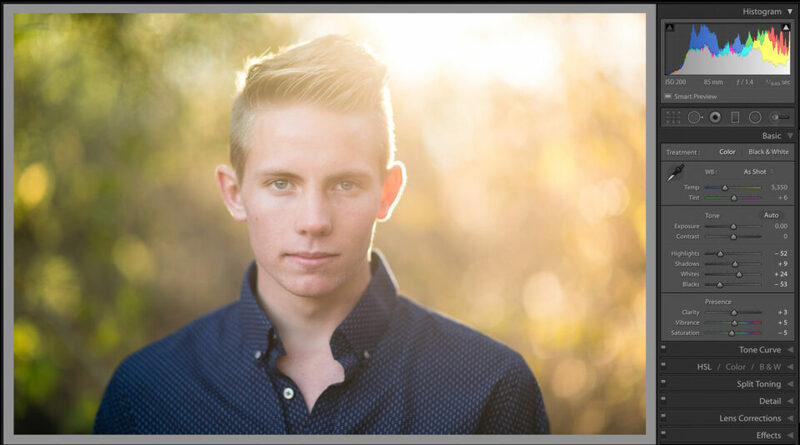 I positioned Sander about 10 feet in front of some bushes that were growing near the river. With the sun behind him, there were specular highlights on the leaves from the direct sun that was hitting them. At an aperture of f/1.4, these highlights turned into the soft, appealing bokeh you see here. Since the sun was behind him, I also used a white reflector to add a bit of fill light to the side of his face that was away from the sun (due to the reflector, you can see a very soft shadow from his collar on his neck). Some people guessed that I used a secondary light source like a strip light or an LED panel for fill, but this wasn’t the case. I had him standing in open shade with plenty of light coming from the sky (which created the horizontal catch lights in his eyes) to keep shadows to a minimum. No additional lighting was used to compliment the sun. Not shown in these settings are also a slight curve adjustment to make everything pop a bit more and split toning to warm things up a bit. I also used Lightroom’s lens correction for the particular lens I used. If you compare the original to the edited version, you’ll also see that I removed a few small blemishes, which is pretty standard for any portrait work. No additional masking or dodging of Sander’s face was involved. Doesn’t it look more plain? That’s because I added two colored gradients, one to each side. I added a slightly overexposed light yellow gradient coming from the top-right corner (which enhances the sunlight) and a slightly underexposed green gradient coming from the upper-left side (which enhances the foliage). Once you know to look for it, this is an effect you’ll see used occasionally in portrait and wedding photography. I never try to go too crazy with it (some people add reds, blues and other colors), but it does come in useful when you want to add a little something extra, yet subtle, to your images. I should also note that this was done before Lightroom introduced the ability to use an eraser brush on portions of a gradient, so if you look closely you might see a very slight tint of green on his hair. Finally, at what point during the photo session did I take this photo? This was one of the last images of the day. I find that almost everyone starts out portrait sessions wanting to do big “cheese” smiles. That’s what we’re taught to do in front of the camera from the time we’re old enough to smile. Photos of a nice big smile are great, but I also like to get some that are more calm and relaxed, as it’s actually a more natural look for our faces (not to mention most teenagers prefer a more “moody” photo to a big smile). This is difficult to do until the end of a session. By that point, my subjects trust me and are more willing to do something a little different, even if it’s only as simple as not smiling for a photo. Hopefully this was fun for you and you learned something along the way. It was great reading all of your guesses and responses. Thanks for playing along and I’ll be on the lookout for another photo to use for the next How Was This Picture Taken! Great! I’ll take two (2) internet points for guessing the ap and the outdoor setting right. I’ll save them for later (when I’ll actually have something to brag about :) ). I really like the post work you did on the image. Great example of the “just perfect” amount of editing in my opinion – it’s super subtle but very effective. Some people go crazy with smoothing the skin or enhancing the eyes, and that can be a total giveaway. Thanks for sharing the details, it was very interesting to read. I’ll have to try the gradient trick sometime! Thanks, Judit! Definitely try the gradient trick. I find myself using it pretty often and really like the extra little something it gives images. Very cool. Thanks for the tip and love the series. Will have to try it. Sure thing, EricL. Give it a shot and see what you think! Great portrait – I always wanted to know how artists make dreamy portraits. I loved the light, mood and the theme of this picture. Thanks for sharing! Thanks Maksim! Glad you learned something! A *very* lovely portrait, John. Well done! Thank you Rick! I’m always happy when I get something that both me and the client are happy with. Awesome portrait. I thought you used curved in Photoshop – never thought of using gradients in LR to add some color mix! Thank you for sharing. Please post more! I did add a slight curve (in Lightroom). Hopefully you can give the gradient trick a try soon! internet points? what the hell. you should not judge photographylife readers for talking about EXIF data and technical details of the image. You have missed the entire point of ‘How this picture was made”. Lkop, I’m not judging anyone. It didn’t surprise me a bit that the readers would dig into the EXIF data (which I left in the image without even thinking about it). My issue is when they only post the camera settings and call it a success instead of actually getting into the practice of looking at an image and trying to think about what else goes into creating an image besides lens and camera settings. Actually you SHOULD judge. This obviously isn’t a contest and it misses the point entirely to merely look at and regurgitate EXIF data. Thanks for your work! Lesson learned for me. Glad you enjoyed it! I use a similar technique to create that dreamy look with the warm natural hair light of the sun. A hold reflector adds more warmth. Love the idea of adding a gradient to the background which yields more flexibility and control. Often the ideal background does not line up with the ideal subject position to the light. 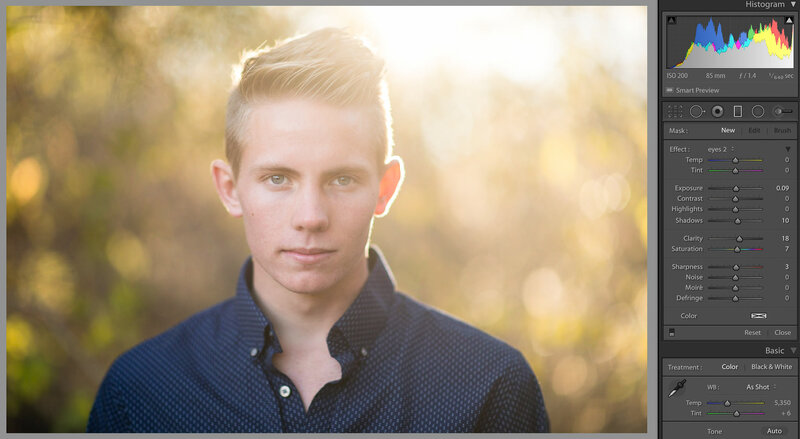 Daniel, I think a reflector is one of the best tools a portrait photographer can have. Try out the gradient trick. It’s great! John, thank you very much for sharing everything. I enjoy reading your posts very much. I have a couple of questions about this beautiful portrait of Sander. 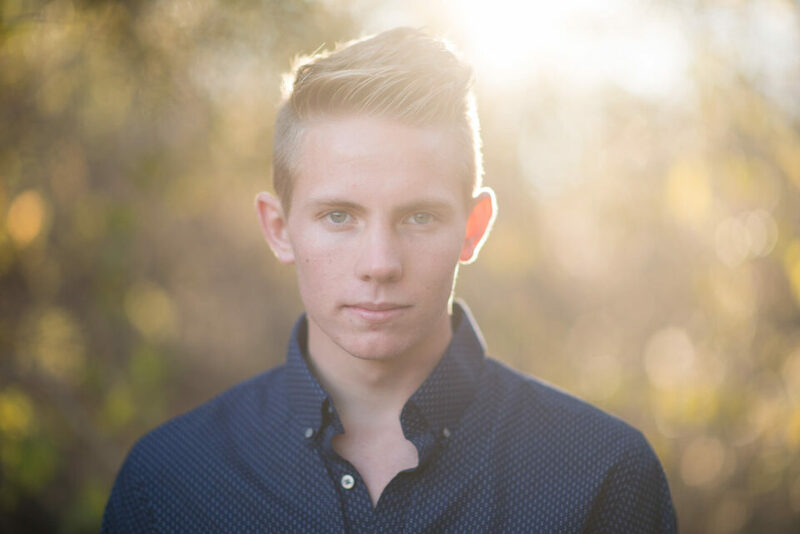 How can this photo be shot in open shade AND at the same time be back lit AND get catchlights in Sander’s eyes? I thought that open shade meant that there wasn’t any sun at all on the subject but that the sun was close by in the background. With the strong backlighting on his neck and hair, how could the sun make the catchlights in his eyes? I love the look and would really like to know this. Again, thanks for all of your hard work. Hi Regina, glad you enjoyed it! I guess my use of the term “open shade” isn’t 100% correct since it is backlit. But, remembering what the scene looked like when I was there, that’s the best way for me to describe it. He was basically surrounded by foliage and I had to position the camera just right to get the sun to burst through an opening in the leaves. Due to shooting with the aperture wide open, it really exaggerates the amount of flair and light in the image. It was pretty much all shade except for a few little places where the sun could sneak through. I put his head in a patch of light (notice even his arms aren’t really back lit), moved my camera around to get the flair and shot! The catchlights in his eyes are from both the sky and clouds which were reflecting some light back into the scene. If you look closely enough, you’ll even see that the catchlights are sky-blue!